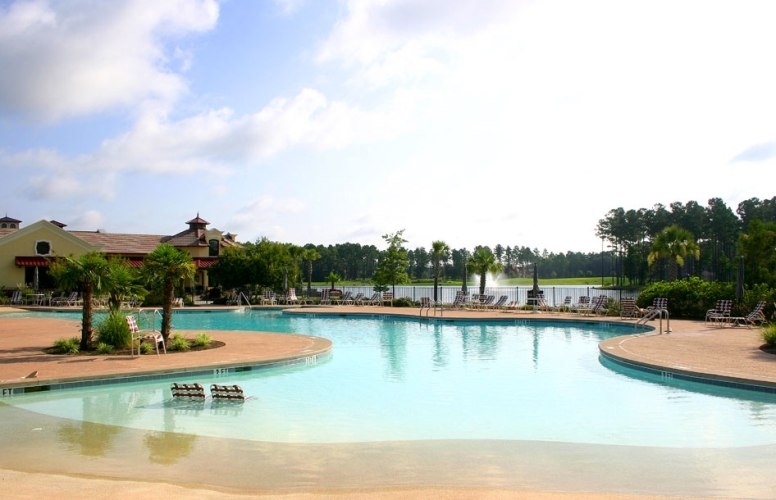 Hampton Hall is a private, gated, country club community nestled within 1,000 acres in Bluffton, SC, and located just minutes from Hilton Head Island, Savannah and historic Beaufort. A community designed after the most charming Mediterranean villages, Hampton Hall was created to cater to every lifestyle. Enjoy world-class amenities, from the private Pete Dye golf course, luxurious central community clubhouse and state-of-the-art Health and Fitness Center, to the miles of hiking and biking trails that wind their way through the community’s natural landscape. The Hampton Hall Clubhouse is a stately 24,000-sf haven overlooking the community’s largest lake of approximately 27 acres. It includes a pub area, al fresco dining on the screened porch, informal members’ area and a large banquet room. The banquet room can be extended to host private parties, business functions, community gatherings, weddings or children’s events. In addition, there are club meeting rooms, billiards room, card rooms and a library. Send me more information about Hampton Hall! The Pete Dye Signature Golf Course at Hampton Hall bears the trademarks of one of golf’s consummate hands-on builders. The course plays from 5,329 yards to 7,489 yards with five sets of tees. Residents and visitors benefit from wide fairways and landing areas while unobstructed green approaches provide a safe route on every hole. A comprehensive practice facility gives you a chance to work on your strategy, which you’ll need when playing this unique, links-style course. Pete Dye has created some of the most acclaimed golf courses in the world, including two of the most famous courses in the Lowcountry: Harbour Town Golf Links and the Ocean Course at Kiawah Island. Send me more information about Hampton Hall! Golfers have their own 12,000-sf golf clubhouse. It features a well-stocked pro shop, plus casual dining throughout the day. It is a fun gathering space to rehash your last round of golf or discuss the latest current events. It is also well-equipped with complete practice facilities and men’s and women’s locker rooms. For real estate options, see below. Send me more information about Hampton Hall! Luxury homes and custom lots are tucked into a village-like community surrounded by the championship golf course, while preserving the native vegetation. Send me more information about Hampton Hall!